Just Romantic Suspense: Taking on the dark side. Taking on the dark side. Congratulations to "Mary P.", the winner in Kara Leigh and Jody's giveaway. Thank you to all who participated! When we first started our plotting and planning, which neither of us are programmed to do, so that in itself was a challenge, we discussed the idea of having the villain’s voice in the story. The antagonistic POV isn’t all that uncommon in mainstream romantic suspense, however it’s much rarer in Christian romantic suspense, so we knew if we were going to do this, we needed a really good reason. And we did! Sharing our antagonist’s, Raymond Scotts, perspective would be an opportunity to fill in some of the gaps for readers so they weren’t quite as in the dark as our heroine, who suffers through most of the book with retrograde amnesia. This also gave us the opportunity to heighten awareness and increase tension. The audience knows bad things are coming even before our characters, because readers now have some insight into the mind of the attacker. Still, when choosing to share this point of view, we had to be careful that we knew what we wanted the audience to feel for Raymond. There are books where the villain’s voice allows the audience to feel empathy for their situation, even if they can’t stand the actions of that character. There are so many fantastic books that do the opposite of this as well. One of our favorites is The Search by Nora Roberts. We know exactly who the villain is and why he does what he does, but there is no empathy. Only a heightening desire to have the characters resolve the conflict before they come to harm. To make the point of view most effective for our story, we used short moments that showed the character’s frustration, anger, and darkness. We allowed the audience to see the escalation in less than a page until the very end. Hopefully, when readers get to the end, this knowledge of our villain will make the conflict and the precarious situation our mains find themselves in, even stronger. Giving the villain page time lets readers feel his anger, but also their panic. For us, our bad guy needed to tie up loose ends or what he was working toward would be ripped away. That’s a powerful motivator. Here’s an excerpt from DANGEROUS LOVE from the antagonist’s perspective. Several local papers were sprawled out on the desk in front of him. He’d combed through each one of them hoping to find something about Alessandra. But there was nothing. He slammed his fists down on the desk. If he knew where she was, he could fix everything. But not knowing was keeping him awake at night, and that was just unacceptable. “Yeah?” he said in response to the knock on his door. “We found her,” Frankie said. Well it was about time. Standing, he said, “I want her brought here, to me, immediately.” And this time he would ensure she was appropriately dealt with once and for all. A string of expletives coursed through his mind, but he bit them back. This wasn’t supposed to be so complicated. It was supposed to be a simple hit job that he ordered and never had to think about again. Alessandra would run straight to said friend as soon as she was released from the hospital. Knowing his associates botched this once already, he needed to have eyes on Kristy. If all else failed, he’d have to use Kristy as bait to get to Alessandra. A story can definitely be told well without this point of view, but it was fun to include him and it challenges writers to get inside all of their character’s heads. Even though we didn’t want to spend a lot of time with Raymond, getting to know his voice that well improved our ability to make Alessa’s fear more authentic. We knew, and so will the audience, what she was up against. We’d love to let you get a better sense of all of our characters, too, and will give away a copy of Dangerous Love to one lucky commenter. Tell us, do you like the bad guy POV in a story? Why or why not? What are some of your favorite books that utilize this technique? left for dead, he starts to feel something he hasn’t felt in far too long: hope. Alessandra Matthews has no memory of the events that led to her being hospitalized. Worse, she has no idea who hurt her or why. 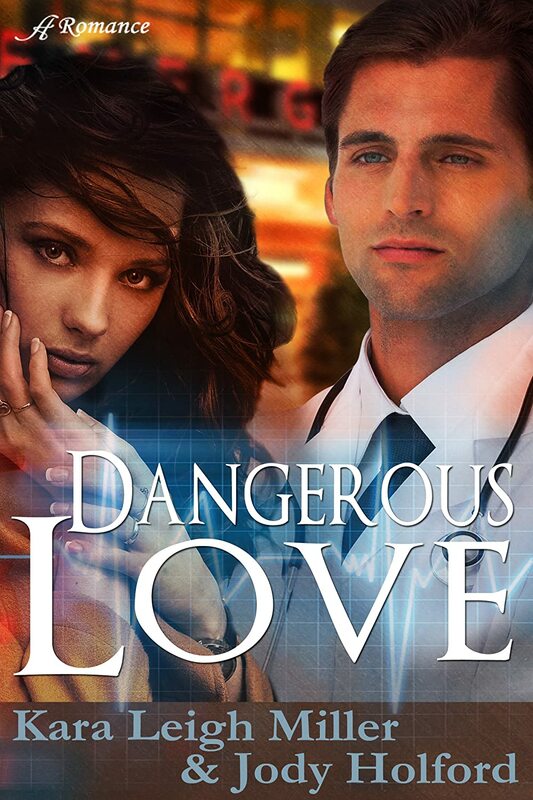 Although she’s uncertain of who she is, she is fully aware of one thing -- she’s falling for her doctor. struggling to put their pasts behind them, theirs is a DANGEROUS LOVE. Kara Leigh Miller: Kara lives in Upstate New York with her husband, three kids, three dogs, and three cats. When she's not busy writing romance novels that leave readers swooning, she's spending time with her family or attending one of her many writers groups. An active member of The Romance Writers of America and the CNY Writers Haven, Kara is also Managing Editor for Anaiah Press' Surge and Romance Imprints. She absolutely loves to hear from her fans and fellow authors, so feel free to drop her a line anytime! Jody Holford: Jody lives in British Columbia with her husband and two daughters. She is a fan of Nora Roberts, Jill Shalvis, Rachel Gibson, and Rainbow Rowell. In reading and writing, she likes characters who are flawed, but driven toward the pursuit of love and happiness. In November 2013, she published A Not So Lonely Christmas with Foreward Literary. In December 2014, she published Forever Christmas through Kindle Direct. Giveaway ends 11:59pm EST April 16th. Please supply your email in the post. You may use spaces or full text for security. (ex. jsmith at gmail dot com) If you do not wish to supply your email, or have trouble posting, please email maureen@justromanticsuspense.com with a subject title of JRS GIVEAWAY to be entered in the current giveaway. I like getting in the Bad guy's head, finding out what makes him tick. I recently read The Prey by Allison Brennan. Her villain was twisted and evil, his goal to finish off a former FBI agent. Through his POV being interjected into the story every once in awhile you get a sense of just how sick he was and see the determination driving him to do the things he did. I don't think it's necessary in every story but there are times i definitely adds to the story's appeal. I don't mind it... kinda gives a different perspective. I like it when you don't know who the "bad guy" is and you see a bit through their eyes. Thanks for sharing! I often like books where I don't know who the bad guy is as it adds an element of whodunit to the story providing it's done well. I've read one too many books where the bad guy POV is included -- without his/her name given -- and they are so over-the-top bad that it becomes comical, and that ruins it for me. I like the idea of having the bad guys POV. I can't recall having read any books like this.